When you think of Indian food the first thing that springs to mind is curries, often those that can be bought from a takeaway or restaurant in your home country. However there’s much more to Indian cuisine than just curries and those you get at home rarely bare much resemblance to ‘real’ authentic Indian curries. India is also a vast country, with nearly every state and even town with their own different speciality. During a trip there, especially if you have limited time you’ll be spoilt for choice and may find it hard to decide what dishes to try. 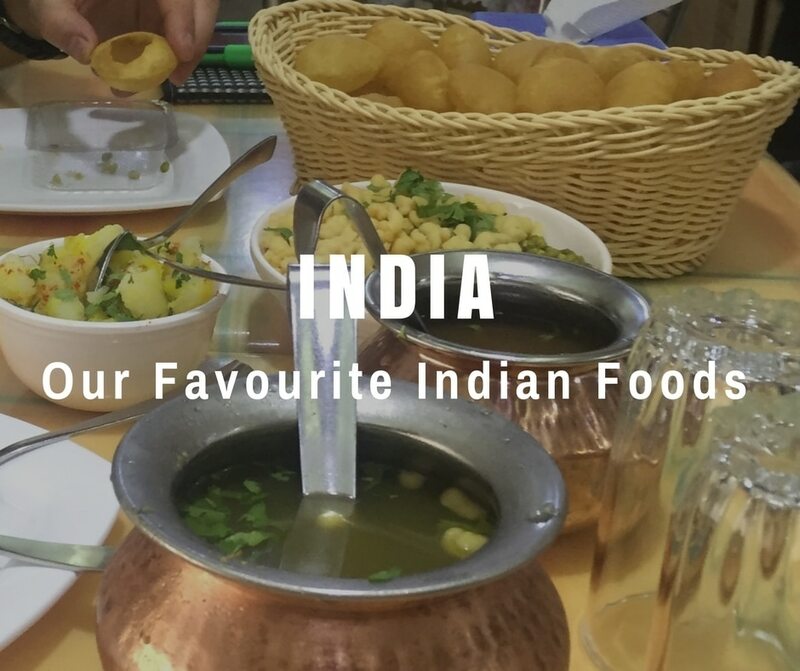 Therefore I thought I’d share our favourite Indian foods from the three weeks we spent travelling in India last year. Whilst three weeks in India is nowhere near enough time to scratch the surface of the country or it’s culinary delights, we gave it our best attempt and pretty much ate our way through India. We lost count of the number of curries we had but think it was somewhere in the region of 50 each. We flew into Mumbai, then travelled down to South Goa, after which we went to Mangalore, Mysore, Nagarahole, Kochi, Munnar, Allepey and finally jumped on a flight up to, and then out of Kolkata. This meant we didn’t get to sample many dishes from the rest of India (although in Mumbai food from all over can be found), so this is by no means an exhaustive list. One day we’ll return and when we do we’ll update this list with any new delicious discoveries. This is the Parsi take on scambled eggs and a much superior version too in my opinion. This breakfast meal, is made differently by every family which means ingredients may vary. It’s usually made with scrambled eggs, mixed with tomatoes, onions, chillies, and garnished with fresh coriander. Sometimes milk, cumin powder, curry leaves, ginger and garlic are also added. Akuri is usually served on toast and is a brilliant start to the day. 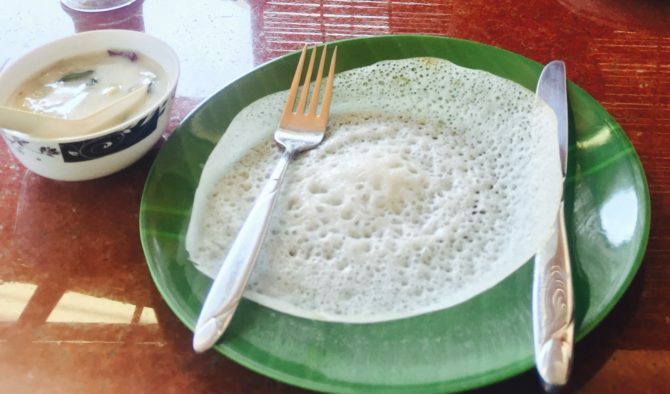 Another breakfast dish (although it is sometimes also served for dinner) Appam is a rice and coconut pancake with a thick, soft centre and thin crispy edges. Initially it tastes sweet then finishes off salty and is normally served with either a meat or vegetable. Although more commonly eaten in Kerala, we had it for breakfast whilst staying at Mangalore Beach Resort, off the beaten track near Someshwar Beach in Mangalore. It was served with vegetable stew and a dry, sweet, grated coconut concoction and was very moreish. 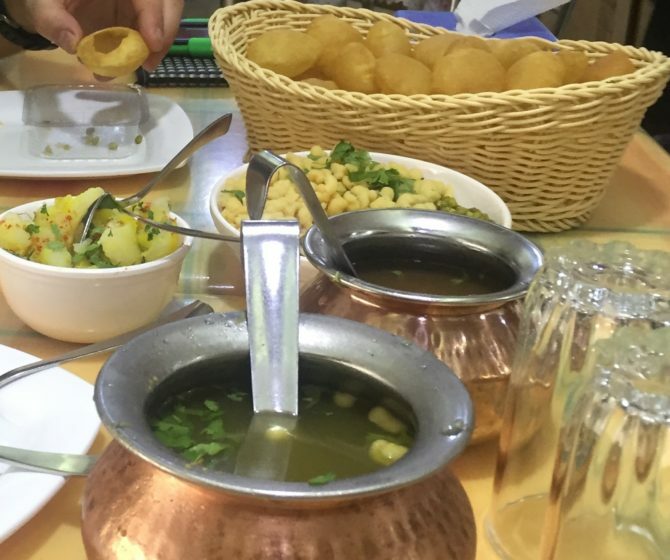 Pani Puri is essentially a delicious combination of two key compenents. ‘Puri‘ is a thin, hollow crisp ball or shell, made from semolina and flour. ‘Pani‘ is a selection of spicy and sweet flavoured waters, potato, onions, and chickpeas. To prepare for eating a small hole is tapped in the top of each Puri with your thumb, which is then filled with Pani. It’s down to personal taste as to if you add the sweet or spicy water or a combination of both. I seriously can’t rave about these morsels of deliciousness enough, which are Mumbai’s most popular street food. However we weren’t ready to risk the hygiene of the street food quite so early in our trip so headed to the highly recommended Elco Pani Puri Centre for brunch one day. It’s the most popular Pani Puri house in Mumbai and rightly so, we managed to demolish over 30 between us! A very simple but tasty starter or appetiser consisting of a very large (in our case) papadam topped with a finely topped salad of tomatoes, onions, cucumbers and spices. This can be bought on the street or many restaurants. We tried it in Cafe Royal, in Mumbai where our entire meal was really good, if a little on the pricier side. If you’re a mushroom lover like me then this is the one for you. Usually served as an appetiser or starter, it’s mushrooms stirfried in soy sauce, garlic, chillies and maybe some spring onions. They vary in heat, but the ones I had in Leopold Cafe and Bar in Mumbai were very spicy indeed, great if you like some heat. An stuffed version of the South Indian ‘Dosa’, which is a thin pancake made of fermented batter, black gram and rice. Masala Dosa is stuffed with a filling mixture of boiled potatoes, fried onions and spices, with a topping of lemon juice, coriander and coconut. In Mysore the dish is adapted further with a smear of chilli chutney on the dosa before it’s stuffed with the potato mixture. A refreshing change to the naan bread that usually accompany curries back home are the various flatbreads available such as roti, chapati, and paratha. 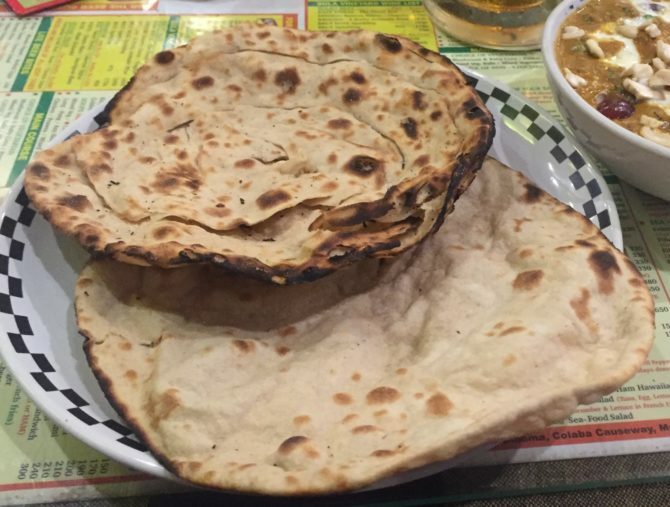 Roti’s and chapati’s are one and the same and made out of a whole wheat flour dough. The golfball sized doughball is rolled into a thin disc and cooked on a griddle, a roti is griddled without oil and a chapati with oil. A paratha is a layered version of the roti, which has ghee between the layers. It can either be left plain or stuffed with a choice of fillings such as potatoes, onions or cheese. All of these breads can be eaten with curry as an alternative to rice, which was Andy’s preference. Indians eat lentil based dal almost daily, so it’s of no surprise that here are many different variations available throughout India. Eating the same dal all the time would get very boring. Our favourites were Dal Fry, Dal Tadka and Kitchari Dal, although we tried many more, especially Andy who had it at least once every couple of days. Dal Fry is traditionally made with yellow lentils which are boiled until soft, onions, tomatoes and spices are fried in ghee then added to the they are then added to dal and mashed together. It has a medium to thick consistency. Dal Tadka starts out in the same way as Dal Fry, but towardsthe end the a selection of spices are heated in hot oil to release the flavours (tempered), creating Tadka which is then added to the dal before serving. 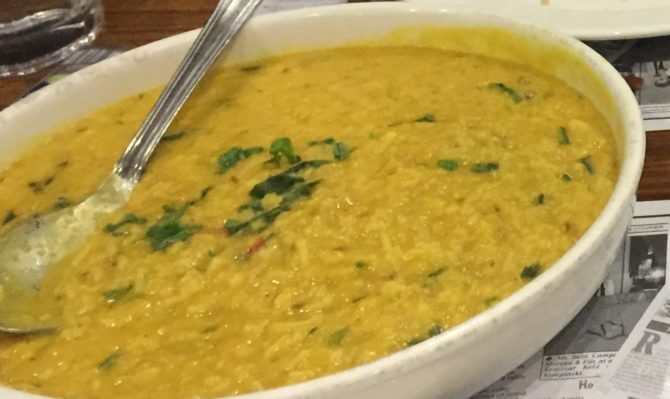 Kitchari Dal is otherwise known as Spiced Yellow Dal and is made from yellow split mung beans and of course spices. It has a much more soupy texture and is also said to have digestive properties. Dal is normally served with rice or some type of flatbread. This inexpensive meal is best described as a buffet for one and usually comes in a meat or vegetarian option. Served on a metal tray or large plate are several small bowls around the edge and a pile of rice in the centre. The small bowls contain various curries, dhals, vegetables, sauces, and curd, possibly accompanied by a papadam or chapati. Traditionally Thali is eaten with the fingers of the right hand, it gives the perfect opportunity to try several Indian foods at the same time…perfect! Andy’s go-to vegetarian side was Aloo Gobi, a substantial potato and cauliflower dish with onion and a hint of tomato, plus green chillies, garlic, ginger and spices. A bit lacking on the correct Indian name here I know, but we tried so many variations of mixed vegetable curries, that I lost track of most of the names. They all varied slightly in the types of vegetables, the spices, the sauce (or gravy), and how spicy they were. However they were all delicious and we didn’t have a bad one. 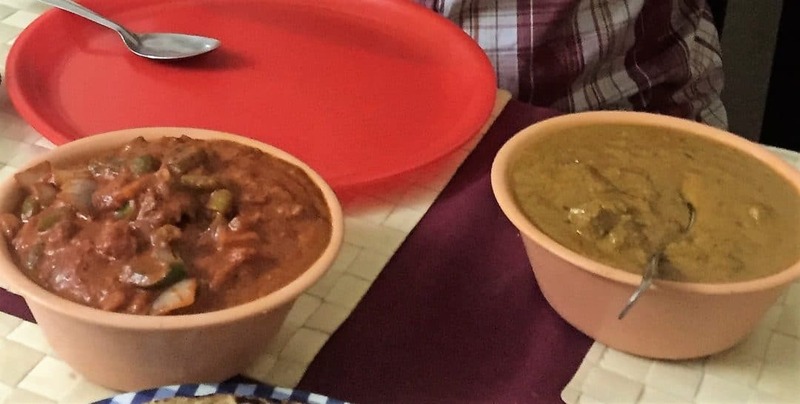 Two that do stick in my mind were (and I hope I’ve got the names right) a Vegetable Kadai – very spicy in a tomato, onion and garlic sauce; and a rich, milder, creamier Vegetable Handi, which we ate in Mangalore. A very simple but tasty side dish Bhindi Ki Subji is sliced Okra (ladies fingers), stirfried with onions, chillies and spices. This was another of my go-to vegetarian side dishes, second to Hakka Mushrooms of course. 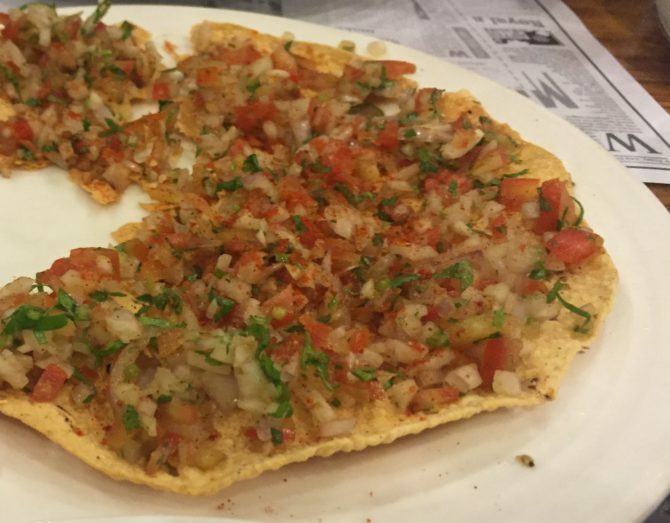 A traditional Indian street food, these are are a deep fried, crispy triangular shell usually stuffed with vegetables, but also sometimes meat. The most common filling that we saw was curried potatoes and peas. These are delicious as a quick snack whilst out and about or as a starter in a restaurant. They are at their best when still hot, crunchy and flaky. Also know as Pakoda, Pakora are another deep fried street food snack or starter. They are chopped vegetables such as onions, potatoes, cauliflower and aubergine (eggplant), dipped in spicy garam flour batter and deep fried. Sometime paneer cheese is also used. This delicacy of Kerala, Crab Masala, is probably one of the messiest things I ate in India, but also one of the tastiest. 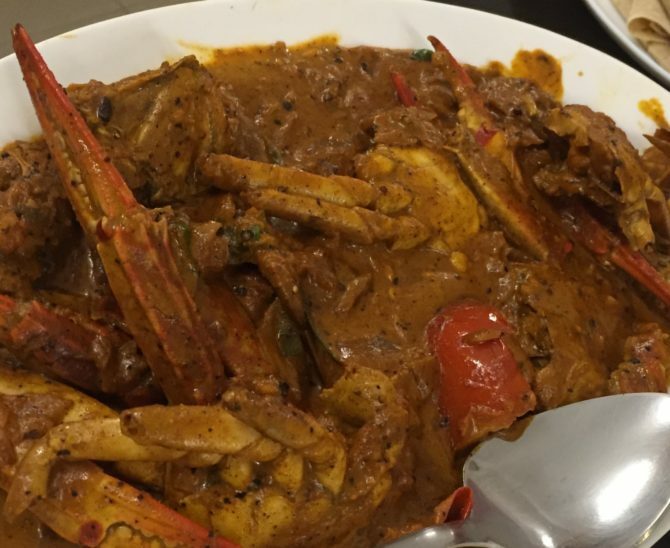 It is basically cooked whole crabs, cut into fairly large pieces covered in a very thick spicy Masala sauce. It’s then eaten with your fingers with the help (if you’re lucky) of some shell crackers. Usually a basmati rice based dish mixed with meat and/ or vegetables and spices. There are so many Biryani varieties in India, it would be difficult for me to even guess which is the best. A matter of taste I would imagine. We sampled Kozikhode Biryani in Alleppey in Kerala, where it’s mostly served with mutton. We didn’t fancy that though and went for a vegetarian version. It sounds like quite a simple dish but the expert mix of spices such as saffron, turmeric, cinnamon, star anise, cardamon etc. gives some unexpected layers to the taste. Sometimes it’s also served with chutney and raita (yoghurt and mint). 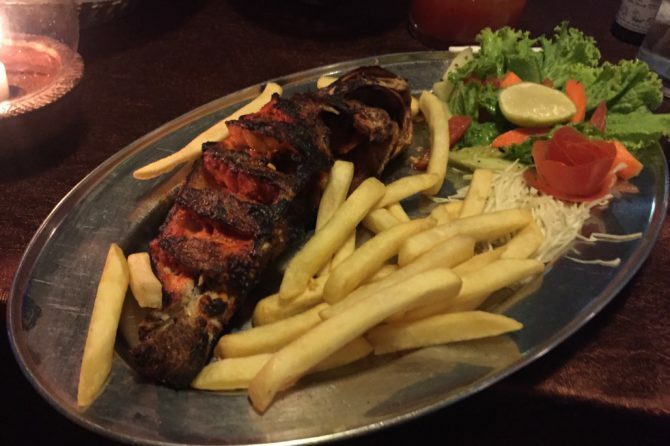 More often heard of is Chicken Tandoori, however down in South Goa I sampled an amazing, mouthwatering Tandoori Red Snapper in a little restaurant called Olive Room just back from Palolem Beach. The whole red snapper was coated in spicy yoghurt marinade and cooked in a special terracotta oven, called a tandoor. The special cooking method ensured the inside of the fish remained moist whilst the outside was beautifully crispy. They also made a great Bloody Mary Cocktail. One of the staple foods in Goa is fish curry. This tends to be an aromatic, sour, hot and spicy, coconut based, curry served with rice. Many types of fish can be used but the most popular is Kingfish, which is what we had in our fish curry during our stay in Palolem in South Goa. 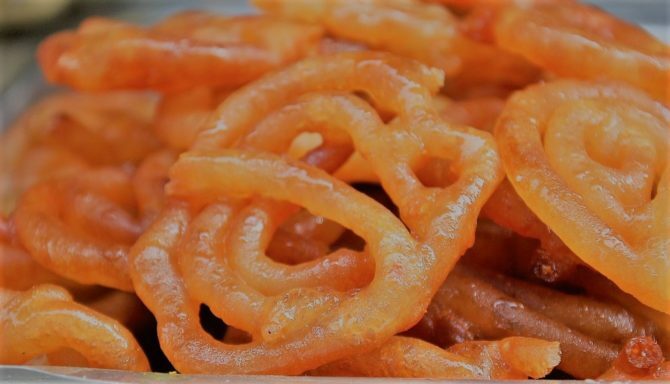 Although this sweet sticky desert or snack doesn’t originate from India I’ve included it as it can be found all over. We tried it at a Kabini River Lodge in Nagarahole Tiger Reserve. It resembles a large pretzel with its deep orangle spirals of deep fried batter, soaked in sugar syrup which crystallises on the outside. The most popular Indian drink, was also Andy’s favourite. It’s a black tea infused with crushed spices such as cardamom, ginger, cloves and cinnamon. It’s heated in a pan, then mixed with sugar and milk to create a very aromatic, sweet, hot drink. You can buy Masala Chai from Chai Wallah’s (vendors) on nearly every street corner in India. The Wallah’s even jump on trains as they pull into a station, so you’ll never be thirsty for long. Although much of above list is vegetarian or seafood that wasn’t deliberate. We weren’t scared off meat by the many people that insist eating it in India makes you sick, far from it. It was just that much of the food in India (except maybe as you move North) is mainly vegetarian (and seafood on the coast), so it just happened. We did have chicken on a couple of occasions and felt no ill effects whatsoever. I can’t wait to return to India and try more of the amazing food it has to offer. Have you been to India? What were your favourite foods that we should try next time we’re there? I am from Indian and very happy to read about you all guys love Indian food. 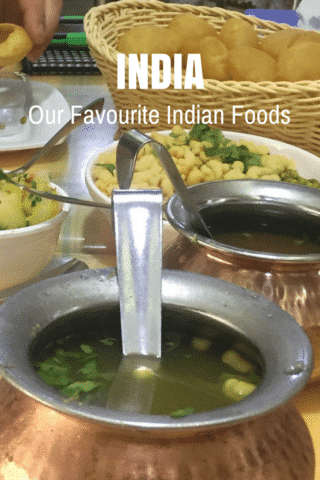 When ever you came in India try some snacks and food listed below. May be a little bit spicy but you will taste like never before. That’s great thanks; we love spicy food so will be sure to add these to our list of food to try if we visit India again! Thanks for sharing this post full of great food. I never heard of Akuri before so something to try on my next trip. My favourites are DAl Makhani, Chicken Korma and Masala Dosa. I love love love Indian food. It is soo good!! I have never been to India but we have great Indian food in New York. And I especiallylove Indian because there are so many vegetarian options and I am a vegetarian so that is great for me. I love channa masala and saag paneer but honestly, i have never had indian food I didn’t like. You’re right, it’s perfect for vegetarians! Also I can’t believe I forgot to include Channa Masala…yum! I may have to add it in when I have time?